Features a 22" widescreen, flat-panel display. LED backlighting gives you a thinner and more energy-efficient screen. 3000:1 typical contrast ratio enables accurate color reproduction. 1920 x 1080 Full HD maximum resolution for a high level of picture detail and a clear, bold display. 6.5ms (black to white) typical response time allows pixels to change colors quickly, so you can enjoy smooth videos. diagonal screen size 22 in. dimensions 12" x 20.2" x 2.2"
SuperClear MVA panel technology delivers exceptional color performance and extends display viewing angles to 178 degrees both horizontally and vertically. Experience accurate and vivid colors with consistent levels of brightness whether looking at the screen from above, below, the front, or the side—with no color distortion or decay. Standard for rapid transmission of data, DisplayPort future-proofs this monitor and delivers the best refresh rate, highest resolution, and incredibly rich colors. This monitor also offers VGA connections, as well as an integrated 2-port USB hub, to support flexibility for both digital and analog media sources, as well as easy connectivity to peripherals and accessories. HDMI is a future-proof video standard that delivers true digital picture and audio clarity. The HDMI interface on this monitor allows you to connect to a variety of HD devices including gaming consoles, Blu-ray players, laptop PCs, digital cameras, and many others for the ultimate true high-definition experience. With advanced ergonomic features, ViewSonic displays provide a greater range of adjustments including swivel, pivot, tilt, and height-adjust options. With five intuitive scenario presets, ViewSonic’s unique ViewMode feature offers best-in-class screen calibration for accurate color rendering and excellent performance. “Game,” “Movie,” “Web,” “Text,” and “Mono” presets enhance gamma curve, color temperature, contrast, and brightness to deliver an optimized viewing experience for different screen applications. 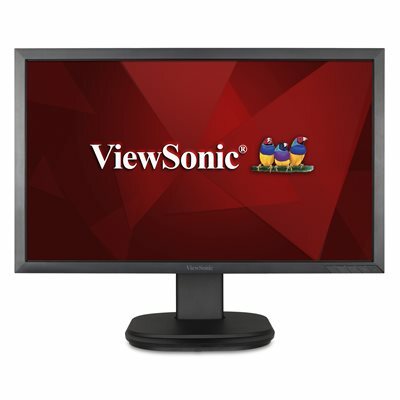 ViewSonic flicker-free monitors deliver a more comfortable viewing experience. Rather than using Pulse Width Modulation that continuously turns the LED backlight on and off, ViewSonic flicker-free monitors use DC modulation backlights that maintain a steady stream of direct current power—nearly eliminating screen flickering at all brightness levels by providing a constant LED light source. ViewSonic monitors feature a Blue Light Filter setting that allows users to adjust the amount of blue light emitted from the screen, enabling longer viewing times and increased eye comfort for work and multimedia applications. ENERGY STAR is a government-backed program that helps businesses and individuals save money and protect our climate through superior energy efficiency. By choosing ENERGY STAR certified products such as monitors and displays, businesses can save energy costs while reducing greenhouse gases. EPEAT (Electronic Product Environmental Assessment Tool) is a definitive global rating system for greener electronics. This monitor has EPEAT Certification, meaning that it meets 100% of EPEAT’s 23 required performance criteria and a minimum of 75% of its 28 optional criteria. This monitor features Full HD 1920 x 1080 resolution for unbelievable pixel-by-pixel image performance. You’ll experience the most amazing clarity and detail whether it be while working, gaming enjoying multimedia entertainment. This monitor is designed with two integrated 2W stereo speakers for enhanced multimedia performance with crystal-clear stereo sound. LED backlighting not only enhances monitor performance, delivers an outstanding color range, and adjusts contrast ratios for remarkably detailed images, but it’s also eco-friendly, mercury-free, and uses less energy than conventional monitors. This monitor features a 100 x 100mm VESA-mountable design that allows you to mount the monitor depending on your specific needs. ViewSonic is committed to using the highest grade panels and offers the industry’s leading pixel performance policy. The ViewSonic VG2239Smh is a 22’’ (21.5’’ viewable) Full HD LED multimedia monitor with future-proof connectivity and full ergonomic functionality ideal for corporate, government and education. Integrated with HDMI, DisplayPort, VGA and 2 USB ports, the VG2239Smh allows flexible connection to PC systems, laptops and other multimedia peripheral devices. In addition, Flicker-Free and Blue Light Filter technology help to eliminate eye strain from extended viewing periods. The LED backlight design makes this display ENERGY STAR and EPEAT certified.